The character before the MN symbol counts, not the one after. But even when I take the character before as the level byte, I still keep getting the same roster. The second/fourth/sixth letters only change the wild Pokémon levels, not the Trainer rosters. Roster numbers are normally determined by the memory address D05D. The reason why "◣ゥ 8" (hex C9) is sent out as the first Pokémon is because the game doesn't update D05D with coast-glitch Trainers so the game loads roster 256 (00) if you haven't fought a previous Trainer. In order to get Professor Oak to have a 94, you must get the game to load roster 28h. The Rocket on Silph Co. 11F just happens to use Rocket roster 28h. You don't have to lose to him to get the roster into memory, you can beat him too. I don't know what you mean. You can access 6 unique glitch rosters with Lance (as the roster number starts at 7 and can be reduced with Growls), and more with glitch Trainer classes (though they activate the ZZAZZ glitch). In total this comes to 6 + 7*9 = 69 rosters. I assume this could also be done with RB:E8, RB:E2 and RB:E5, which have dex #245, and therefore do the same thing but to the sixth slot? In theory they should, however all the Pokémon you mention froze the game when I got them to appear on the opponent's side. You'd need to do the Cable Club blackout glitch in combination with the Johto guard glitch (or maybe the remaining HP glitch) to get them to appear as well. The only known item mutation glitch Pokémon (when Paco81 and I researched them on the temporary forums) that can be seen without the Cable Club blackout glitch are 94 #213 (via Prof Oak roster 28h) and p PkMnp' ' #230 in Yellow which can be seen via the Ditto glitch with a Special stat of 194. This must be the most significant discovery since the Mew glitch. You've enabled nearly all the useful Select button glitches for use on Red/Blue. Great job TheZZAZZGlitch. I was too sleepy to think well. Yes, you can access 6 glitch rosters with Lance (02h - 07h). 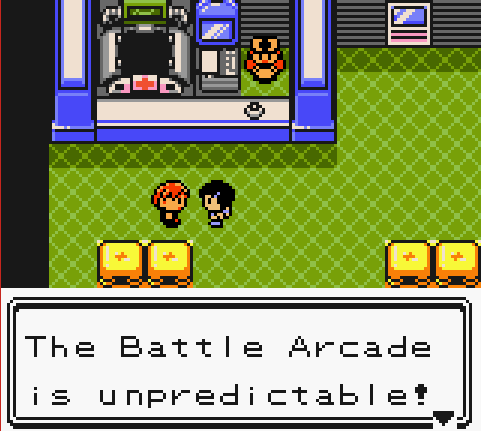 However, encountering ZZAZZ glitch trainers doesn't end up fighting the actual roster. The game fetches other data from elsewhere and replaces the roster during the blackout time. For instance, opening the Fly menu before the encounter makes the glitch entirely different. surely you can use p PKMN p to get the glitch item ws m? Actually, If I think more about it, doing it in Yellow is even easier than on Red/Blue. Encountering p PkMn p' ' in Yellow will add 32 to the identifier of the fifth slot in bag if the item does not have one of the following hexadecimal identifiers: $2X $3X $6X $7X $AX $BX $EX $FX. Having X Speed on the fifth slot and encountering p PkMn p' ' is enough to get "ws m". Note: All tricks from Red/Blue with an exception of "changing the second item" won't work in Yellow, as the addresses are different. They need to be modified in order to work. Note in Yellow D323 is the identifier of item 4, not item 3. You could replace step 9 with having Growlithe (21h) as the 8th Pokémon instead of Fearow (23h) to get b = 21 (where D321 = item 3). Now, i wonder if there is a similar item in JP Yellow, and in fr/de/es/it RBY. Interesting nice to hear that this can be done in yellow as well as Red and Blue. As for walking through walls and escaping from a trainer battle, it involves storing whatever is in register A into a memory address. However, what value does A happen to be when executing this code? A is never modified in the bootstrap code, and I don't see it anywhere else, either. Or am I missing something? That was a mistake, thank you for pointing that out. Edit: Thanks to Torchickens and his information about encounter flags, I have found a new, easier and side-effect-less method of obtaining 8F in Red/Blue. It does not require having a specific name, unlike the previous Prof. Oak's glitch roster method. Instructions/requirements/execution steps can be found in the first post in this thread. This code uses only 5 basic items, and will easily allow you to modify any byte in RAM one wants to.